For most Fairfield County residents, Long Island Sound is just a short car-ride away and offers an abundance of saltwater fly fishing opportunities. Even for those without access to a boat, wade fishing from shore can put anglers within casting distance of striped bass, bluefish and other saltwater sports species. The Sound, which was heavily polluted and saw depleting stocks of striped bass and other fish just a few decades ago, has had a re-birth of sort thanks to changes in environmental laws on the many inland rivers and watersheds. The result is a world class saltwater fishery with an increasing chance to hook into a trophy bass or blue. Access to the Sound, though becoming more limited to some degree, is still quite prevalent. From Greenwich to Fairfield, the typical "beat" fished by area residents, there are literally dozens of places an angler can get down to the water. It would be difficult to include all of the locations, but below are a few of the top choices. Your local fishing shop is well staffed to give you more specific pointers depending on where you live. The best way to fish the Sound is by boat. If you don't have one, make friends with someone who does, and offer to pay for fuel for the day. In the deeper waters of the Sound, and also off the string of mid-Sound islands, referred to as the Norwalk Islands, fishing can be phenomenal throughout the season. Along with larger striped bass and bluefish, in the fall, anglers have a chance at tuna species such as false albacore and bonito which make quick runs through the Sound during their winter migration south. Along with the typical flats boat most common among fly anglers, fishing from a sea kayak can also be an effective and relatively cheap way to open access to all types of water. 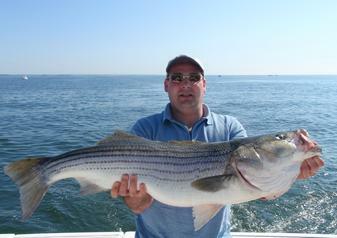 When fishing Long Island Sound, anglers are best armed with a 9-foot 8- or 9-weight rod and a large arbor reel with plenty of backing. 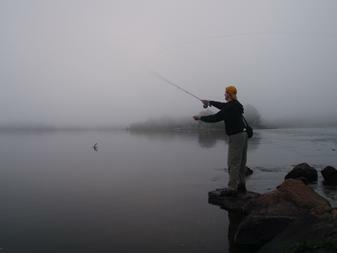 The ideal line for fishing from shore is an intermediate sinking line, with a sink rate of around 1 to 2 inches a second. If fishing from a boat, a depth charge line with a faster sink rate, perhaps 5 to 8 inches a second, is preferable. Leaders should be at least 12 pound test or higher, and when bluefish are around it is wise to have some steel leaders with you, as otherwise you are likely to lose more than a few $4 flies to bite offs. Holly Pond: Located at the border of Stamford and Darien at Cove State Park, Holly Pond is a tidal pond where incoming tides rise through a narrow inlet, flood over a dam and fill the pond with saltwater. 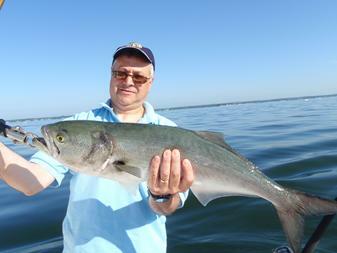 Baitfish move up into the pond and stripers and blues quickly follow. 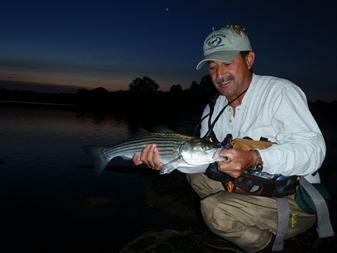 At high tide, anglers can fish the upper end of the pond, near Giovanni's restaurant. On the falling tide, the best action takes place at the dam itself, where stripers and blues will line up above the dam chomping down the baitfish as they try to sneak past and back out into the Sound. As the tide recedes further, the bass and blues move below the dam, and continue to stage further and further out of the inlet mouth as the tide moves out to sea. Access can be more difficult here, as parking at Cove Park requires a Stamford resident sticker. 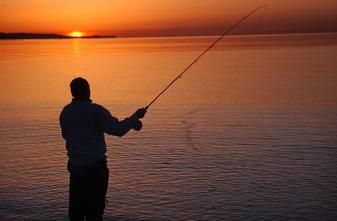 In the early morning hours, anglers can access the park with minimal fear of being ticketed. After the summer season, however, parking in the park is more relaxed and not enforced as heavily. On the other side of the Holly Pond inlet, Weed Beach in Darien also offers angler access, but without the restrictive permit parking. While not as ideal a location to fish from, under marine laws, anglers can make there way from Weed Beach along the shoreline below the high tide mark up to the Holly Pond dam and fish from there, following the tide out in a similar fashion. Bass and blues will also congregate along the Weed Beach side of the inlet, so fishing from that side can also be excellent. Compo Beach: Located on Compo Beach Road in Westport, Compo Beach is another popular location for wade fishing. Again, parking is limited during the summer season and daytime, but anglers arriving in the early morning and again in the evening have no problem getting into the parking areas. The beach is dotted with stone jetties and other structures which draw stripers in, and the beach itself offers easy wading for quite a distance out from shore before dropping off. Anglers can walk the shoreline in either direction from Compo to fish off more structure and ledges dotting the shoreline. Sherwood Mill Pond: Located on Hillspoint Road in Westport, just past compo Beach, the Sherwood Mill Pond is another tidal pond, similar to Holly Pond. The outflow from this pond on the falling tide can be extremely productive. What makes the Mill Pond most attractive to wading anglers is the large expanse of "flats" extending out towards the sound in the inlet. As the tide drops, anglers can follow it out close to one mile from the main beach. Bass and blues stage at various points along the flats, or cruise the flats in search of prey. At the outermost edge of the flats, the water drops fairly precipitously from a few feet at low tide down to around 10 feet in depth. This rapid change in water depth is a clear signal to look for bass and blues to stack up in a feeding frenzy. Pennfield Reef: Located off Reef Road in Fairfield, Pennfield Reef offers an excellent opportunity for anglers to wade far off the coastline. The reef extends out more than a mile towards a distant lighthouse. It is best, and safest, to fish the reef on an outgoing tide, as the churning water confuses the baitfish and means an easier meal for big game fish. Anglers making it out to the point on the reef, which becomes completely exposed at low tide, should take care to head back in shore as the tide starts to rise. The reef is not a straight line, and it also has dips and rises, meaning while an incoming tide on the point may only be knee deep, at some points between the angler and shore it is already at waist level or higher. When fishing Pennfield Reef, it is also a good idea to make a few casts on the "Shark Bar" a shark fin shaped sandy flat projecting to the right side of the stone jetty when standing on the shoreline looking out. 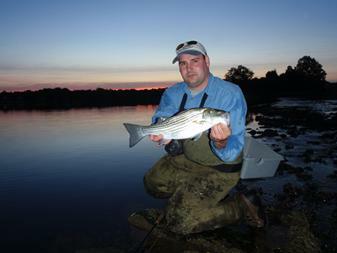 Like the flats at Sherwood Mill Pond, the Shark Bar also offers a chance at cruising stripers looking for an easy meal.